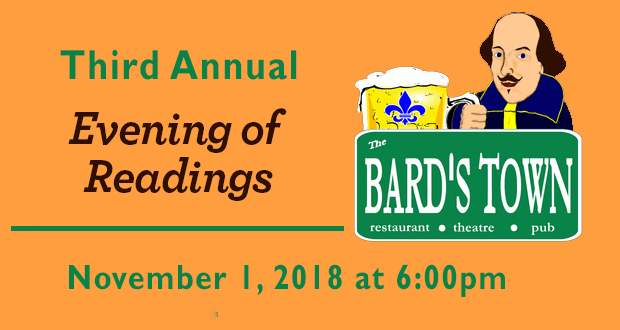 Please join us at The Bard’s Town 1801 Bardstown Road, for Women Who Write’s Third Annual Evening of Readings on November 1, 2018. Gather at 6:00 pm to order beverage and food. Readings will begin promptly at 6:30 pm. This event is in lieu of our November WWW monthly meeting at the library. All genres are welcome. For those interested in reading a ten-minute piece or less, email your name and title to Diane Cruze at sdcruze55@yahoo.com. First come, first serve with preference given to those who have read at our monthly meeting. Maximum of 12.